It is no surprise that "Thriller Live" continues to thrive in London's West End given the strength of the material: The songs of Michael Jackson. What comes through (too) loud and (not quite) clear during the course of the production is how many varied hits the late artist actually had - that and the adoration he and his material elicit from others. Cynically one could look at this production as a glorified tribute act, albeit with top-notch production values, but it is certainly more than that. 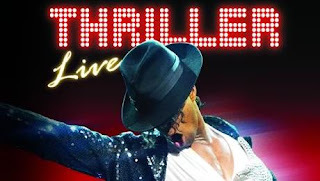 "Thriller Live" is a fitting tribute to the "King of Pop" performed as a quasi-chronological presentation of some of Jackson's most popular songs sung by four principal singers and a dance ensemble performing his unique style of choreography. The concert style setting and lighting (by Jonathan Park and Nigel Catmur, respectively) creates a perfect environment, including video walls, in which to present some outstanding musical numbers although the costumes by Shooting Flowers, whilst obviously influenced by and reflecting the various looks of Jackson, leave something to be desired: There is certainly a case for designs attuned more to each individual performer. That said, some of the ensemble costumes, especially during the "Thriller" and "Bad" album sequences, are spot-on. It is unfortunate that the sound mixing still requires work as the bass-heavy music overwhelm the vocals of the singers onstage. Given most of the voices featured exist in the Treble range it is surprising that the sound could be so clumsy. The band itself are sharp: Not a single off-note and the arrangements are superbly performed. Gary Lloyd's choreography echoed Jackson's authentically whilst he seamlessly weaves in his own work to compliment the pre-existing material. His direction, however, is a little lacking. There are times throughout where his staging becomes static and uninteresting, especially in the first act where the space is used to little advantage. Act two, however, springs into renewed life; no doubt because the material is from Jackson's most successful period - the "Thriller" and "Bad" albums. Here the staging and choreography become intensely dynamic, almost verging on becoming full-blown musical numbers and it is here that the show coalesces into a complete whole and works perfectly. Every now and then a little dialogue on the history of Jackson and his career is presented but this is nothing more than filler material for the most part and frankly wouldn't be missed if excised. All told, given that so much musical material is crammed into two and a half hours, the show does feel a bit long in both acts and wouldn't suffer from a little trimming here and there. The company are nothing short of excellent and each ensemble dancer is able to present themselves both as an individual dancer and as part of a core of tightly drilled dancers performing in unison. It is also refreshing to see a company of performers who look age-appropriate. When not drowned out by the band the four singers (Angelica Allen, Adam J Bernard, Shaquille Hemmans and Rory Taylor) soar almost effortlessly and do due justice to Jackson's original vocal stylings although many of the lyrics are lost in the wall of sound. But, occasionally, a singer - Taylor especially - is able to punch through the bombast and leave an impression and Taylor's solo number "She's Out Of My Life" is one of the many highlights. When dance and vocal performances gel it is truly an excitingly thrilling experience and there is many a time throughout the show when this is the case. One of the better concerts-for-theatre "Thriller Live" is a great reminder of the dynamic force that was Michael Jackson and is a surprisingly energising show that creates something akin to a party atmosphere amongst an audience ready and willing to lap up the pure Michael Jackson energy produced. Thriller Live is at the King's Theatre until Saturday 23rd April. For tickets and information visit the ATG website.